You need some science fiction, and you need it now. Unfortunately, you don't have a ton of money to spend. 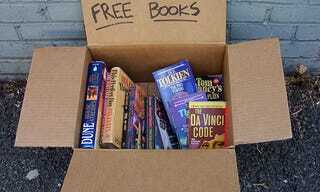 But as long as you have an internet connection, these resources will help you get free books and stories online. Project Gutenberg is the premiere spot for finding free books online, and they've arranged their science fiction collection into a nicely-organized bookshelf. From the bizarro contents of 1930s Astounding Stories to every single novel HG Wells ever wrote, you'll find a wealth of classic science fiction. If you're craving contemporary novels for free, Random House's Suvudu Free Library brings new fiction to you for free. So far they've posted eight books, including ones by Laurel K. Hamilton and Elizabeth Moon. They promise to add more every month, so check back for a free dose of new fiction! If you like swashbuckling escapism, then you won't want to miss Baen's massive free backlist of novels, many from the 1980s, all available for free download. Google has a small collection of public domain science fiction novels and zines from before 1923. One of the best and longest-running science fiction journals online, Strange Horizons consistently publishes incredible fiction from promising newcomers and stars alike. The site is updated weekly with fiction, art, poetry, and reviews, and you can plunder their extensive fiction archives whenever you like for that much-needed free fiction fix. Tor.com is another amazing online publication, connected with the publisher Tor, which updates daily with reviews, blog posts, art, commentary, and (hooray!) tons of free fiction from authors you know and love. Cory Doctorow serialized his new novel Makers on Tor.com before it hit print, and you'll see regular stories from luminaries such as Charles Stross, Elizabeth Bear, and John Scalzi. Check out the fiction archives, or just browse the site. One of my favorite resources online for finding new free fiction is called simply Free Speculative Fiction Online. Created by Richard Cissée, this pleasingly minimalist site exhaustively lists every new (free) short story, novella and novel posted online that is in the spec fic genre, broadly defined. Come here to find old favorites or strange new tales from authors you never would have encountered otherwise. It's a must-bookmark resource. Image by Eric Doeringer, from a weird and slightly mean art project via Art in Odd Places.